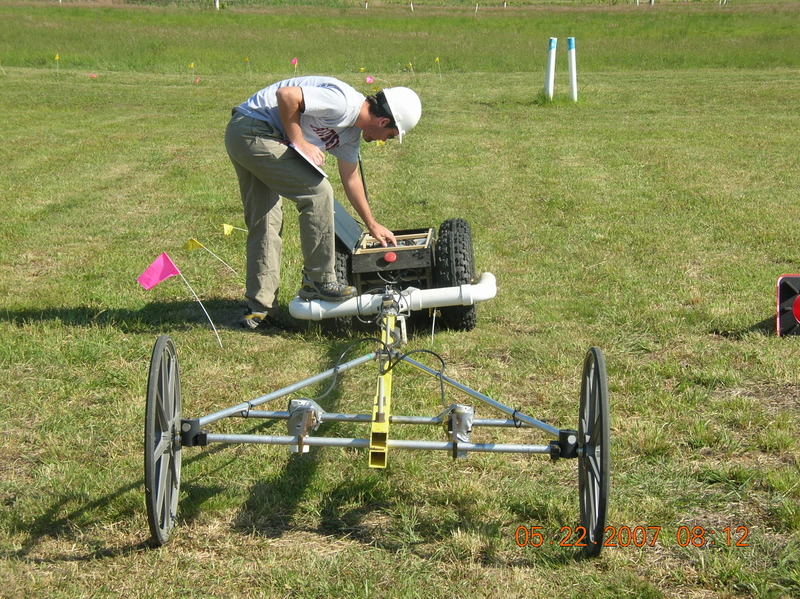 An initial demonstration of tele-operation of the system and an in depth study of its effects on the geophysical sensors was performed at Redstone Arsenal in Huntsville, AL in June of 2006. The Segway RMP with a EM61Mk2 and the ArcSecond laser based positioning system are shown below. An initial demonstration of the system to the Corp of Engineers was performed in May of 2007 at the standardized UXO test site at Aberdeen Proving Ground (APG) (http://aec.army.mil/usaec/technology/uxo01.html) in Aberdeen, MD. Two areas of the site were mapped, the calibration lanes and portions of the open field area. Both areas are seeded with various inert ordnance items. 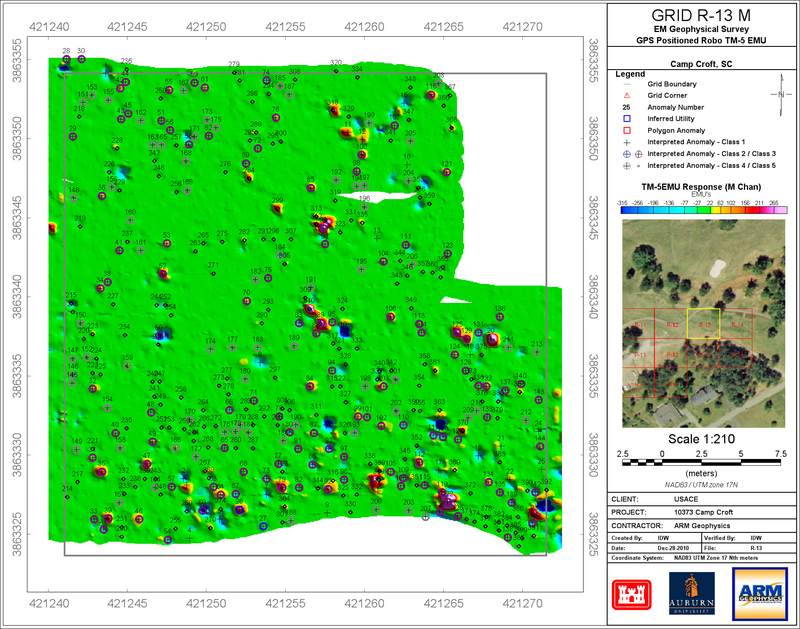 A 2.8 acre portion of that field was broken into 4 grids and surveyed autonomously towing a single Geonics EM61-Mk2. The resulting maps are shown below. Several open areas can be seen in the survey where deep water or holes made it impossible to survey. The brightly colored regions indicate the presence of a metallic material, which could be a UXO item. 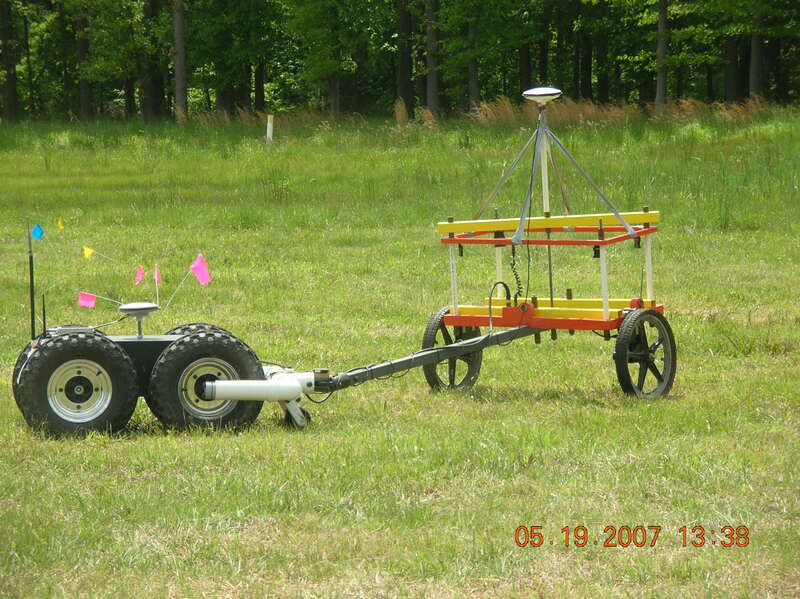 A Geometric G-858 Cesium vapor magnetometer was also used to survey the calibration lanes at the site. 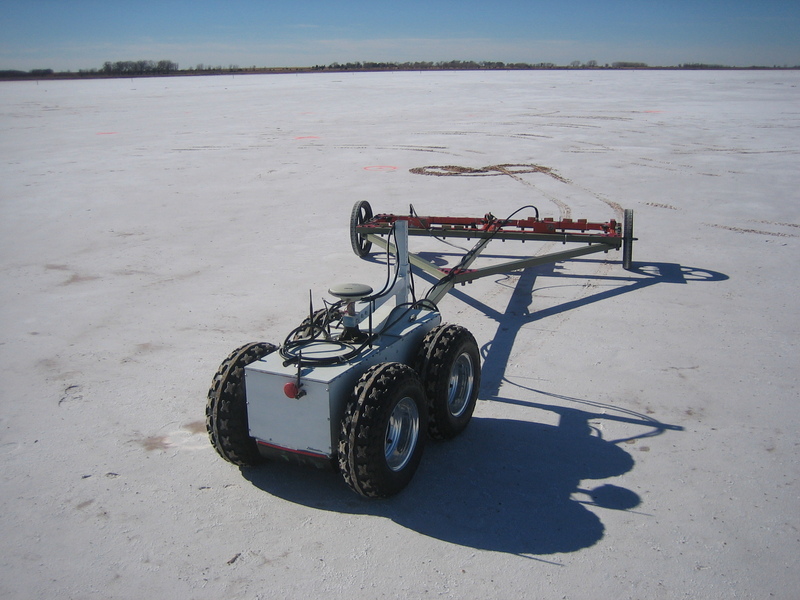 The first technology transfer of the system to a contractor for use on a real-world project site was performed with Parsons Corporation in December of 2009 at the former Great Salt Plains Bombing Range in Oklahoma (http://www.fws.gov/southwest/refuges/oklahoma/saltplains/) and at a portion of Camp Sibert near Gadsden, AL. The system was used to tow a custom fiberglass trailer built by the Corp of Engineers carrying two EM61-Mk2 sensors. The robot and trailer at the GSP site are shown below. 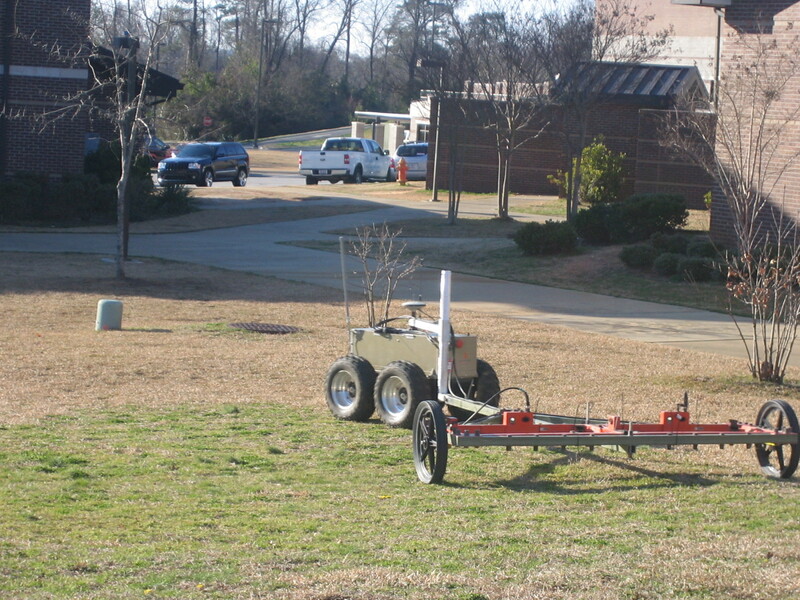 A portable office was set up on site and the robot was operated and monitored remotely at distances of up to 1.5 miles. The Segway system surveyed on average over 2 acres per day at both sites. Areas at both sites were surveyed with both the Segway system and traditional methods to compare their performance. The results showed that while problems still exist, the system has potential for commercial use on UXO project sites. 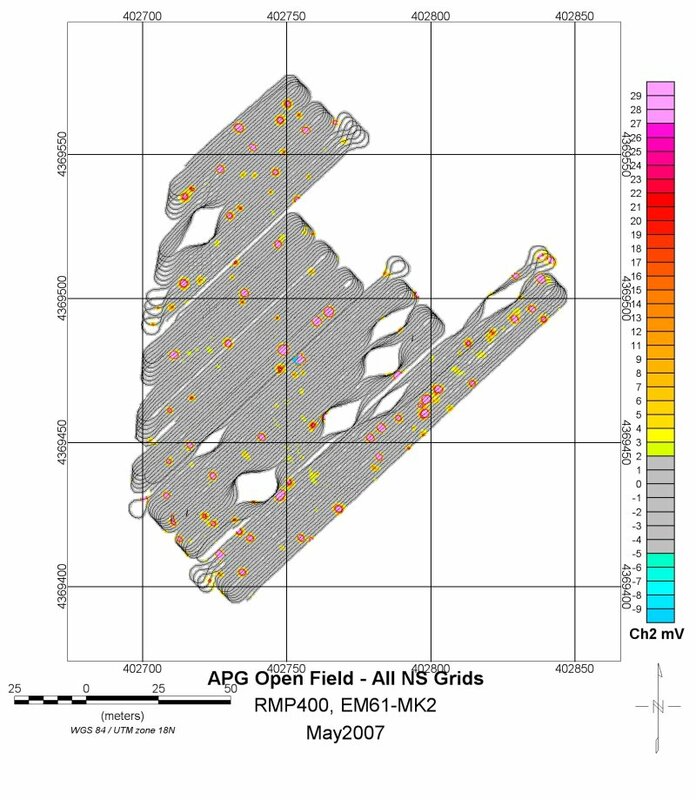 An analysis of those results has been presented by Parsons at the 2010 Symposium on the Application of Geophysics to Environmental and Engineering Problems (SAGEEP). A survey was conducted around the Ranger Barracks at Ft. Benning, GA in February 2010. The survey was in response to buried ordnance which was found during construction near the barracks. The courtyards around the barracks as well as a nearby hillside were surveyed using the Segway RMP towing two EM61mk2’s. 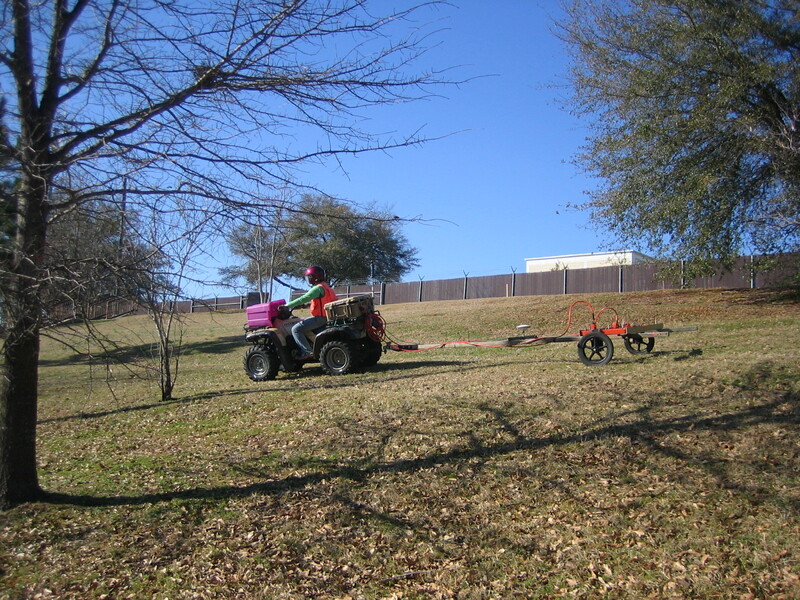 Several other areas were surveyed using a dual EM61mk2 towed behind a manually driven ATV. This demonstration was the first using the Segway with its gearboxes inverted for additional ground clearance. A survey was performed by William Woodall and Mike Payne from Auburn using the Segway RMP at a golf course on Former Camp Croft in South Carolina in December of 2010. This survey was performed in conjuction with ARM Geophysics with support from GAP Geophysics. Both the Geonics EM61Mk2 and the GAP Geophysics TM-5 emu were towed during the survey. The TM-5 emu is a electromagnetic sensor that is less susceptible to the effects of “hot rocks” or areas with high concentrations of ferous material in the ground. The soil in the former Camp Croft area contains highly magnetic soil that can appear as an anomaly on a standard sensor such as the EM61Mk2. Maps showing targets picked using both the M and H channels of the TM5emu are shown in the images below. The Segway RMP system returned to APG in May 2011 to demonstrate the new grid-node surveying capabilities. This survey was conducted by Mike Payne, Adi Singh, and Dr. John Hung from Auburn. The goal of the demonstration was to determine if discrimination quality geophysical and positioning data can be obtained from a standard EM61Mk2 system. Grid node surveys attempt to improve data quality by moving short distances (~0.2m) and then pausing for a short time (2-3 sec). Data is only recorded when the system is static. This serves two purposes: 1) motion and vibration induces noise in the EM coils that is not present when they are static 2) the fact that the system is static allows both the geophysical and position data to be averaged, thus reducing the effects of noise. Additionally, a tilt sensor was added so that the trailer orientation could be measured and used to account for the GPS antenna lever arm. Since the tilt sensor used was based on accelerometers, its readings were only valid when it was static as well. 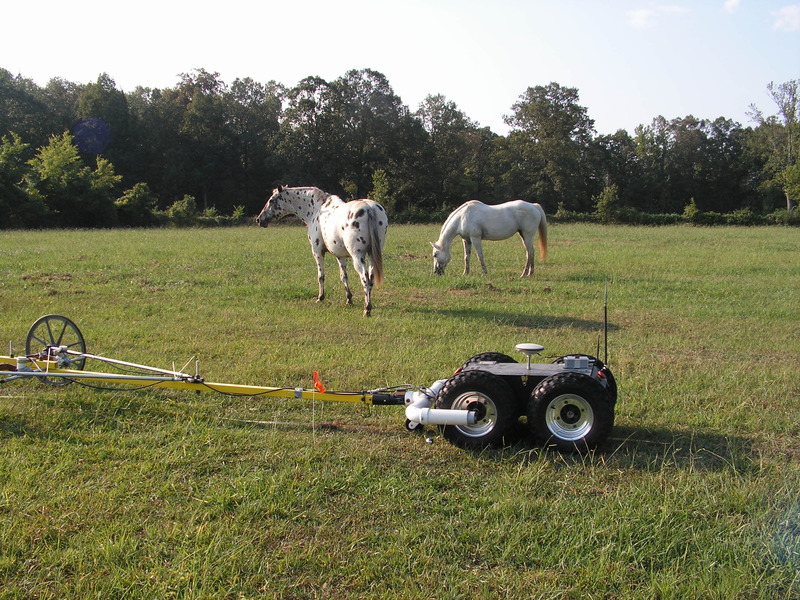 The recently completed Polaris Ranger EV platform performed its first autonomous survey at Fort Campbell on the Tennessee – Kentucky line in _____ 2011. The survey was performed by Lowell Brown and William Woodall from Auburn in conjunction with the Army Corp Huntsville Center. A dual EM61mk2 sensor package was towed for the survey. The 1m x 1m coils typically used for the original EM61 were used with the EM61Mk2 for this survey instead of the 1/2m x 1/2m EM61Mk2 coils.